There are plenty of reasons for our family's ouef adoration and whenever we eat eggs in the morning I feel good knowing that my kids are heading out the door to school with a good dose of protein in their bodies. Kenya and Chloe are pretty happy when they see eggs on their breakfast plates, but add the word pizza to the equation and they will certainly tell you I've gone gangbuster delicioso! That's what happened when I paired two of our families favorites together in this one simple recipe. 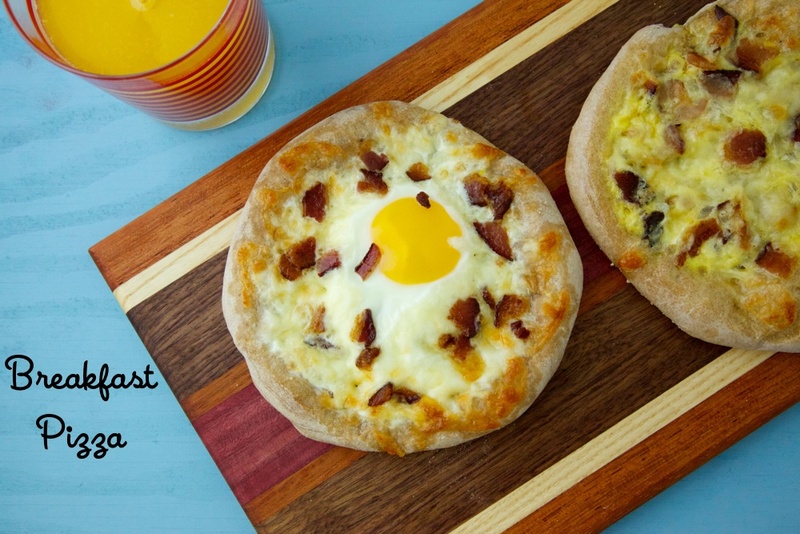 Breakfast Pizza. Feel free to make this meal your own and top your pizza with cooked bacon, breakfast sausage, or any of your other preferred breakfast toppings. While you're at it, have some early morning fun and get the kids involved in making their own pizza. It's easy to do and you'll send everyone off for their day with egg lovin', happy bellies! 2. Cut pizza dough into 4 even pieces and shape each piece into a 5-inch round. Using you fingertips, press the dough down about 1/2 inch from the edge to create a raised crust. This will help prevent the egg from running off the edge. 4. Bake for 12 minutes, or until eggs are set and cheese is melted. *Note: You can also whisk together the eggs and salt and evenly divide the mixture then pour evenly on top of each pizza. I thought they were English muffins...of you think it would work you sub. I'm making them right now on an English muffin. The only thing I could see being different is the pizza dough holds the egg in. Mine kind of ran off the side. Yum! Always nice to mix things up for breakfast. Sometimes I just use eggs as the 'dough' for our breakfast pizza then top it with sauce, cheese, mushrooms etc... It's great for when we are a little more rushed. Did anyone at Weelicious actually test this recipe? No matter how \"carefully\" you crack an egg over a flat surface, it is going to spill over at least one side. Which it did. Just made these using some whole wheat pizza crust I had on hand. I scrambled the eggs and topped with mozzarella slices and bacon. Holy Cow! They were better than I expected. The eggs did run over the edge of the pizza dough, but next time I will make sure to make more of a raised crust to prevent that from happening. Very yummy! Anything pizza is a hit at our house. It's all how I position it. Pizza for breakfast is a winner. Love this! Would be great on an english muffin too. I've made these with thick-sliced whole wheat bread and they're delicious! I just pushed down a depression in the middle of the bread, which held the egg quite well. I also butter the bottom side and place them on parchment paper. I especially like them with mushrooms and some parmesan cheese, but I precook the mushrooms first. Yummy stuff! I had a problem with the whole egg running off of the crust too. Little dude ended up with scrabbled eggs and sausage for dinner (he certainly wasn't complaining though). I wonder if this would work better if the dough was cooked a bit before the eggs were put on? Or if it was one big pizza instead of 4 smaller ones? I will definitely give this recipe a try again - just need to do some tweaking with the dough. Yes, the egg ran over the edges, but my kids still loved it! I agree! I love your recipes, but want to see more GF! This was ok. Nothing special. Had a tough time getting the egg to cook all the way through. More like 25 mins than 12. I partially baked the crust with corners folded up which helped the eggs stay on the crust vs running off the sides. Still the runny centers and extra time to fix was too troublesome. The crust overwhelmed the dish so it was really more like pizza than eggs. I'll stick with quiche for a baked egg dish.